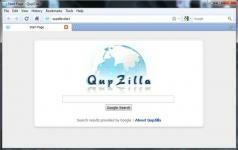 If you travel often and using various computers and laptops you do not own, having a portable web browser such as Portable QupZilla can solve a lot of problems. This simple browser requires no setup and can be launched from external storage devices such as USB flash drives. It has a clean and functional UI with support for multiple-tabs and a Speed Dial similar to Opera’s. Portable QupZilla also bundles other essential features such as a Web Inspector to analyze and view web page source code, a Download Manager and an RSS Reader. The tool has a built-in ad-blocker that can be easily customized, as well as a cookie manager that lets you create a whitelist and a blacklist to filter stored cookies. Furthermore, the browser not only supports add-ons, but also WebKit plugins you can use to expand its capabilities.